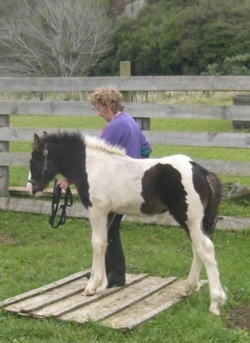 Silk's filly is a fun, bright wee girl who loves people and attention. She has an incredible amount of feather, more that some purebreds, and moves beautifully, with an extravagent, groundcovering action. Will make a fun allrounder and best mate. "Flash" is gorgeous. 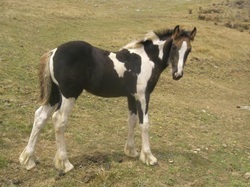 He has striking markings and movement, athletic, with a real "look at me" presence. He is also bold and friendly, and has a generous, unflappable nature. Would do well inhand, is from strong jumping lines on his dam's side, and should be able to turn a hoof to pretty much anything that is asked of him. SOLD: Congratulations to Nicole. Flash was a pleasure to have around, and we will really miss him. Kind and gentle, Earnest is an old soul. Very gypsy in his nature, he is calm and takes everything in his stride. Is friendly, but not pushy or impolite about wanting attention. Surprisingly elegant mover, and can really cover the ground. Earnest would make a great family pony, suitable for a small adult rider, and would make a fantastic kid's pony with time and education. Indi is a very striking, elegant girl. From strong performance lines on her dam's side, she is naturally athletic, and moves very well. Beautiful kind eye, and correct from head to toe. Curious and friendly. We're very proud of this beautiful girl, and know that she is going to bring much happiness to whatever home she goes to. Eligible for the Breeding Up programme. Possibly homozygous for colour, results pending. Mayflower is a beautiful filly, and will grow into a big, strapping girl. Is becoming quite a tank. Is super-friendly, rushes over as soon as she sees you. Has had a couple of very relaxed training sessions and most of the basics were covered (We bought Grace in for a feed when Mayflower was a few weeks old, and Mum and I got chatting, and just sort of started playing with her, and in no time she was haltered, responding to pressure and release from the rope, and lifting her feet, without us really meaning to do much with her, haha). She's very like her mum, a bright, eager-to-please little character, who thrives on attention. Lovely, ground-covering movement. 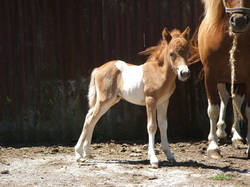 ie's Colt, "The Vicarage's Kacey"
Ben is a beautiful colt, and has been a pleasure to know. He is classy, polite, bold, and moves very well. He has found a wonderful home, where he will be hunting, eventing, and generally enjoying himself! 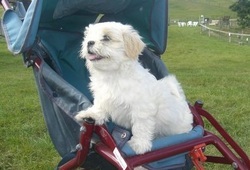 Congratulations to his new owner Jenny... we're looking forward to hearing updates of all their adventures together. Oh, how we love this boy!! He has the easy, kind nature of a purebred, in a tall, nicely conformed package. We are thrilled at the wonderful home he is going to. 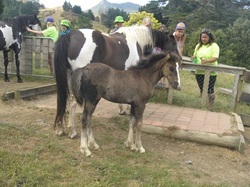 He is going to a dairy farm in Taranaki, where he will be pampered and loved by Michelle, and will be a mate (and eventual riding horse) for her horse-mad young son. George thrives on human attention and loves kids, so this is a very good fit all-round. Midnight is going to be a pleasure horse, and a replacement mount for a steady, quiet, aging gelding. Her purchaser Kim, is planning to lead Midnight from her gelding during their future rides together, as a way of familiarising her with the world. Jan has done most of Midnight's training, and raves about her obliging nature, "she should have been named 'Angel'", to quote her. She is grazing next to Jan's house, and neighs at her whenever Jan steps out the door, which is very sweet. Midnight is coming back to us at some stage to be served by The Vicar, and we're looking forward to seeing her again when she's all grown up. 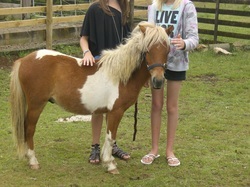 Johnny was one of the first Gypsy partbreeds that we bred, and is very special to us. He has found a wonderful owner in Brenda, who plans to leave him entire, and use him for dressage, general pleasure riding a a bit of breeding. Johnny has a EMH of 16.2+hh, and has the most relaxed, people-loving nature imaginable. Totally unflappable, Johnny is also blessed with outstanding movement, correct conformation, and is from strong jumping lines. Johnny has covered a couple of our taller sporthorse mares, and so far one is confirmed in foal. He was so gentle and relaxed about the act of horsey-love that it was almost comical. All the mares stood like rocks for him, which just goes to show that nice guys can get the girls! This classy filly is well-conformed and moves beautifully. 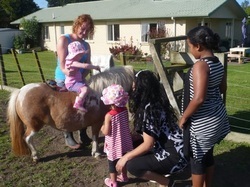 True to her Gypsy Cob breeding, she is friendly, relaxed and sensible. With an EMH of 15.2hh +, is going to grow into a very impressive girl. SOLD! Saphira is heading to a small farm in Christchurch, where she will be doing a bit of inhand showing, and once started, quite a bit of everything. Congratulations Pam, we're really delighted that this sweet girl is going to such a wonderful, knowledgeable home. 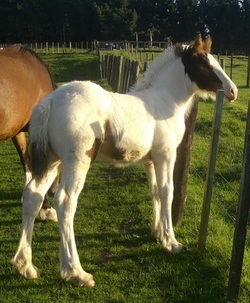 Rocky was only the 2nd 3/4 gypsy cob colt born in NZ, so was a rather exciting arrival for us. He was an absolute delight from the day of his arrival, a sweet little soul who loves people. He was fantastic in all his initial training, very willing and obliging, never put a foot wrong and enjoyed all the attention. Rocky sold very quickly to a fantastic home. He is to be gelded and used as a riding horse, using Parelli methods in all his future training... Congratulations on your purchase, Andrea, we hope you and Rocky have lots of fun together! Tonka is a real headturner, with stunning movement and great conformation. 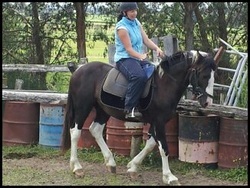 This is his first day under saddle - you can't quite see it, but his owner Saph has a huge smile on her face! Samson is our first foal out of Jennie, and delivered on our high expectations on what this special mare can produce. Samson has bone, presence and movement. He is a very impressive colt, and we think he has a big future ahead of him. 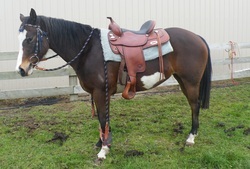 Sold, gone to a great home as a pleasure horse. We breed quite a few different types of animals; miniature horses, American Paint horses, donkeys, shih tzu dogs, spotty sheep, llamas, alpacas, poultry and are New Zealand's largest commercial axolotl breeders (not such a big achievement, as we are the only breeders!). 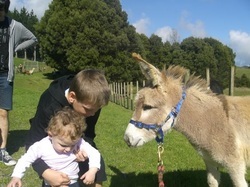 All of our animals have a rather unique start in life - being born at a Farm Park they get an enormous amount of contact with people, and leave the farm very well socialised. With every companion animal breeding programme our philosophy is the same; start with the best quality animals that we can find, with correct confirmation, and are as close to their breed standard as possible. And then only breed from them if they prove to have exceptional, people-loving temperaments, and have a bit of the "X-factor" about them... if they make us and everyone else who meets them smile, then they qualify to add to the gene pool. 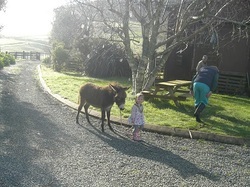 Hi there just a quick note to say Toffee has settled in nicely - he is a lovely donkey and has enjoyed regular walks with us. He is very easy going and there have been no issues with him leading and he is lifting his feet nicely for us. In the short time he has been here he has already brought lots of happiness and fun. Hi Sue, We've fetched Skye from the airport today. She's the cutest and adorable wee puppy, we all love her to bits. Jessica is extremely happy and couldn't stop playing with her and cuddling with her. No doubt she is comfortable being around people, and easygoing. Thank you for the most wonderful experience, your quick answers to our queries and close contact really helps alleviate any doubts we had buying a puppy from the internet. Can't fault it, really a pleasure to deal with such nice people. Your kind help in organizing shipping, not to mention the discount, was hugely appreciated. Hi Sue, Picture attached says it all, as you promised she is a safe as houses with the kids and just thrives on all the attention. I even took her for a walk today up our road (to help with weight control haha) and she seemed to really enjoy it and met half of our neighbourhood, will be known as the crazy lady that walks her pony for now on haha. Rosie as she is now called is just a gem. She learns very quickly and nothing much phases her - was a piece of cake to break in. Thanks again for such a lovely sweet hassle free horse. Well done to your breeding program. 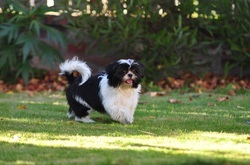 Shai Ming is such a delight, a wonderful companion and a great advertisement to your breeding program. 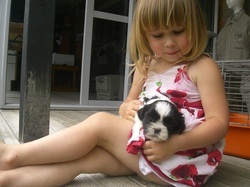 Her temperament and nature ensure that she is well loved by the grandchildren, family and friends. Best $ss I ever spent. Just to let you know that Buttons and Happy are settling in well. Today they went to the beach. I had tears in my eyes watching Buttons gallop around like a dog off the chain. Happy was just contented to roll and roll in the sand. He really loves me already and is like my shadow. After that we did a little lap around Waihi Beach town. They stopped at every shop and let people come out and give them a cuddle. I'm amazed at how quiet they are. When we got home we brought them inside for some carrot, Happy wasn't too sure at first but he really trusts me already and was very calm. Thank you so much for giving me a chance to buy these two special animals. They are going to bring so much joy to everyone. Hi there Sue, Just a line to let you know how our puppy is doing, we named him Marley, he knows this name now & comes when called... he has adapted really well here with us & follows me everywhere, I adore him & so does my hubby. So thank you for introducing us to him.